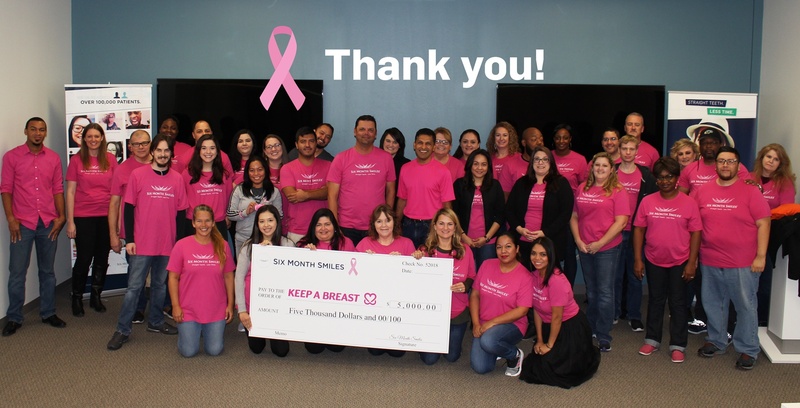 We at Six Month Smiles want to say a HUGE THANK YOU to all who participated in the “GO PINK” campaign to raise money for Breast Cancer awareness! Our goal was $1 for each like, comment and share on our GO PINK Facebook/Instagram post, and we exceeded our goal of $5000 - ONE WEEK EARLY - all thanks to you! Our partners at the Keep A Breast Foundation have expressed their heartfelt thanks to be able to keep spreading awareness and prevention to young people about this important issue facing women. This is a great cause and a great team accomplishment! Thank you all again for every single link, tag, share and comment you made on the post this October. The Six Month Smiles Community is strong and a force that can change the world, as we change patient’s lives every day! We ALL did this TOGETHER!